“What’s the capital of Texas?” I asked Noah, as I got up from his bed after our nightly bedtime snuggle last night. “You know which one I don’t know? It’s a hard one,” he said. “I think it’s Columbia. I’ll be right back.” I went to check the sheet of state capitals I’d found on the Internet and printed for him during the endless stream of snow days last week. I came back into the darkened room. “North Carolina: Raleigh. South Carolina: Columbia,” I said. It was the eve of the Geo Bowl. The competition had been postponed twice this month due to weather, but it was on for this morning. (The potential snowstorm on Monday turned out to be rain.) At dinner last night, Beth broached the subject of good and poor sportsmanship, not because we have any worries about Noah’s behavior. Noah’s an extremely good sport and always has been. He could lose a game of Chutes and Ladders graciously at the age of three, whereas his sister…well, she’s not there yet. Beth was worried that if there was gloating from the winning team, whether it was his or another one, it might catch him unaware or hurt his feelings. He thought about it and named one of his teammates as the most competitive and likely to revel a bit too much in victory. “He’s not too upset when he loses, but he gets really excited when he wins,” he said. I wondered if the boy in question had studied more than Noah. While Noah did get bored enough to study the state capitals (and his times tables, which his math teacher recently asked us to review with him) during the snow week, he really hasn’t studied that much since qualifying for the team, although he has attended a few study sessions, both at school and at his friends’ houses. Noah picks up facts very quickly and easily but he’s not much for disciplined, solo study. I was glad the contest is structured so that all the members of the team are allowed to consult with each other before answering the questions. That way, they all have the benefit of whatever knowledge each member managed to glean from the booklet they were issued back in November. Noah’s most concrete contribution to the team, prior to the actual competition, was to design the t-shirts (with some help from Beth). 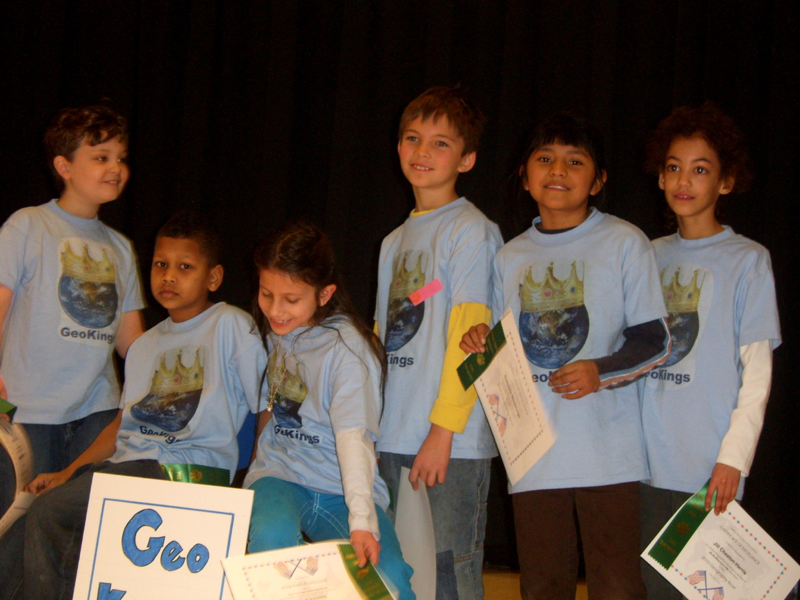 As his team was called the Geo Kings, the shirts sport a globe wearing a crown. A while back I asked him why the team was not called the Geo Kings and Queens, as half the members are girls. “Mommy, I didn’t vote for that name,” he told me impatiently. This morning Noah was keyed up. He was up before five, though I didn’t become aware of him stirring and yawning and muttering to himself until June woke me for diaper change at 5:35. Needless to say, none of the three of us got any more sleep. Once the kids were up, Noah kept crashing into June and annoying her, so I sent him down to the basement to jump on the trampoline in hopes that would calm and focus him. After some discussion he decided to wear a flannel shirt over his Geo Kings t-shirt rather than the t-shirt over the long-sleeved shirt. I was afraid if he removed the flannel shirt for the competition (his plan) he would lose it, but Beth told me privately she thought he might be concerned about being singled out if he had the Geo King shirt visible all day. One day last month, Sr. S announced in class that Noah was the only one to have a perfect score on the math portion of a standardized test and that day at lunch, some kids told them they had a special seat for him because of his perfect score—far away from them. He’s been pushed and pinched at school recently as well. I wasn’t sure that was what was really going on with the shirt, but it made me sad to think he might want to cover it, after putting so much work into it. He even said this morning, before the Geo Bowl had started, that making the shirts was the best part of the experience. I don’t ever want him to feel he has to hide his light under a bushel. The gifted school is looking better and better. We’ll find out if he’s accepted in April. Beth drove Noah to school and I met her there, after leaving June at school. Even though the crowd of parents in the audience was not huge, we knew a high proportion of them, as many of Noah’s friends had made the teams. There were three girls who went to the Purple School with Noah (Jazmín, Jill and Samira). Jill has always been very shy, so I was proud to see her up there on stage. Many kids he’s known since kindergarten and several of his closest friends were also there. Sasha and Maxine were on the Golden Gators team. Maura and Joseph were on the Red Hot Chili Peppers team and Sean was the spokesperson for the Geo Kings. We chatted a bit with Maxine’s mother before the Bowl got underway, touching on how much less challenged the more advanced kids seem to be in third grade than they were in second (we blame the focus on standardized test prep) and how social interactions have gotten more complicated and sometimes negative. Then it was time to start. The first two rounds were on state capitals and the very first question for the Geo Kings was the capital of South Carolina! I wondered if it was a good omen. They go it right, in fact all the teams got all their questions right for the first five rounds. It was really a wonderful thing to see. All the kids looked so proud and confident. Sometimes Noah jumped straight up into the air or gave a teammate a high five after the judges declared an answer correct. I was proud of all the kids on all the teams and I didn’t want anyone to miss a question. But of course, eventually they did. In the last three rounds instead of sending a spokesperson to the judges with the team’s answer, the scribe wrote the answer on a white board and held it up for the judges to see. This was where it got competitive. The answers were multi-part and worth more points. The question that undid the Geo Kings was to name four of the eight “Mountain States.” They took the question to mean any states with mountains and answered California, Colorado, Georgia and Maine for one out of a possible four points. The Golden Gators supplied four correct answers and the contest was basically over then and there. Even though Noah’s team only missed one more point, they finished last, three points behind the winning team: the Golden Gators. Beth went up to the stage to take pictures and to make sure Noah got his flannel shirt back on and didn’t leave it in the Multi-Purpose Room. I gave him a quick, wordless hug as his class lined up to leave. In the parking lot, we chatted with Maura’s mom. She asked if we’d applied for the gifted center and if we’d send Noah if he got in. Yes and probably, Beth answered, adding that we’d been more conflicted in the fall, but that this year has been dispiriting. She said she had the same experience when her older son was in third grade. As Noah was getting ready for bed, he was telling Beth about a Civil War-era historical novel they are reading in language arts and he mentioned it took place in Ohio. “What’s the capital of Ohio?” Beth joked. “The Geo Bowl is over! C’mon,” Noah said. It is over but I won’t soon forget all those bright and eager faces, as the kings and queens of geography took their places on the stage and how for the longest time, no-one missed a question and they were all golden. 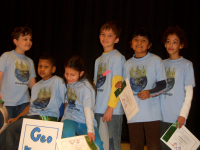 But I just want to add—the Geo Kings had the best shirts. No contest there.